On large microwavable plate, arrange tortilla chips in single layer. Sprinkle evenly with 1 cup of the cheese. In medium bowl, mix chicken and enchilada sauce. Spread evenly over cheese layer. Sprinkle with 1/2 cup of the cheese. Top with green chiles. Top with remaining 1/2 cup cheese. Microwave uncovered on High 3 to 5 minutes or until chicken is heated through and cheese is melted. 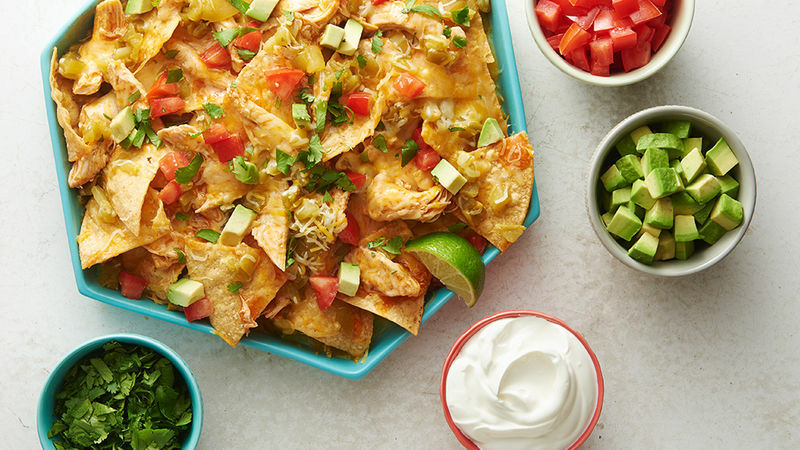 Top with nacho toppings. Make it your own! Use other shredded meats, like pork tenderloin or pot roast in place of the chicken. Top with fried eggs, cooked sausage and salsa for an easy riff on huevos rancheros.